Hempstead, Town of Hempstead, Queens Co. L.I. 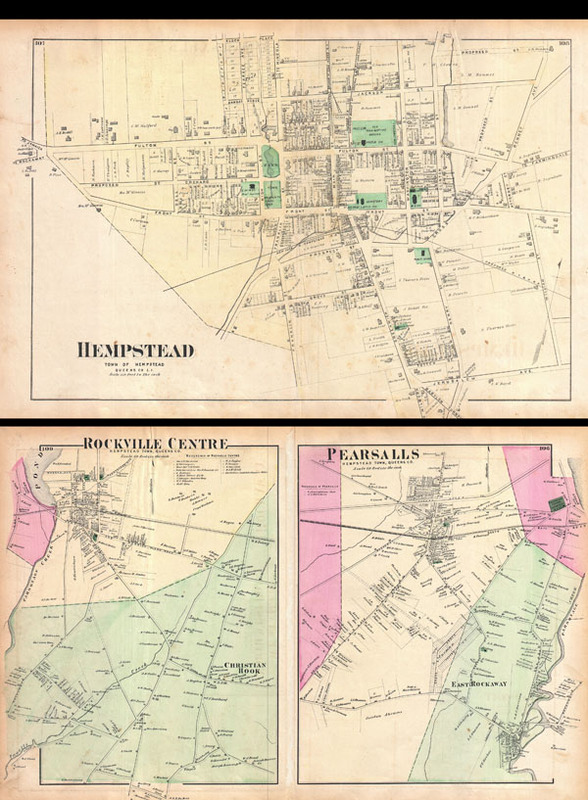 / Rockville Center, Hempstead Town, Queens Co. / Pearsalls, Hempstead Town, Queens Co.
A scarce example of Fredrick W. Beers' map of the communities of Hempstead, Rockville and Pearsalls, Long Island. Published in 1873. Maps printed on both recto and verso. Hempstead side depicts the town of Hempstead from Jackson Street south to Jerusalem Avenue. Details St. Georges Cemetery and the Old Town Burying Ground. Verso features maps of Rockville Center and Christian hook as well as Pearsalls and East Rockaway. Detailed to the level of individual properties and buildings with land owners noted. This is probably the finest atlas map these Long Island communities to appear in the 19th century. Prepared by Beers, Comstock & Cline out of their office at 36 Vesey Street, New York City, for inclusion in the first published atlas of Long Island, the 1873 issue of Atlas of Long Island, New York. Very good condition. Original folds. Maps printed on both side of sheet. Light foxing and toning. New York Public Library, Map Division, 1527304, 1527303, 1527305.